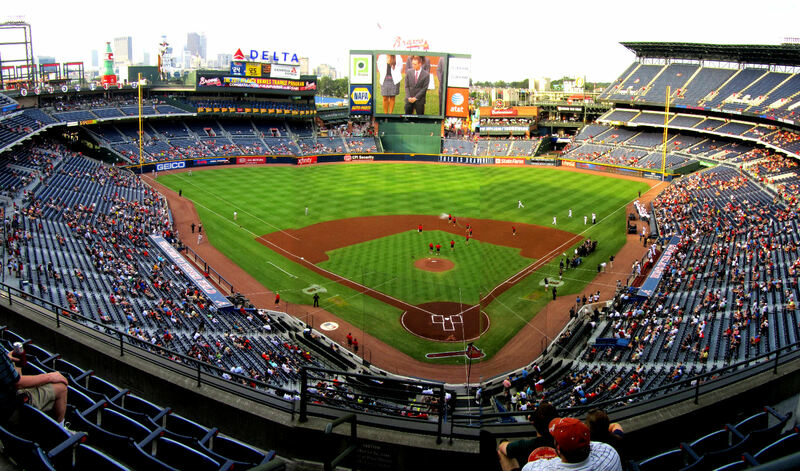 Turner Field really isn’t anything special when it comes to looks. That and it has tons of ads when you look towards the outfield. For me, ads, unless they blend classically with the stadium, are a negative. On the positive side, because it is built in the style it is, it has some oldish charm to the stadium. The scoreboard is beautiful and prominent. The reason I had it on the positive side of a C is it really doesn’t have anything that detracts from the game experience, but it has certain qualities that enhances the visual aspect of it. Okay, I know it looks like the Rangers do in the map, but I think they’re being very generous to the Rangers and the two Florida teams. I think the three teams surrounding the Rangers have a bit more of that territory, and the two Florida teams are still very young. While they may hold the majority of fans in the regions highlighted, everyone over the age of 45 in the region is more likely to be a Braves fan than anything else. Both the Marlins and the Rays have been around for less than 20 years. 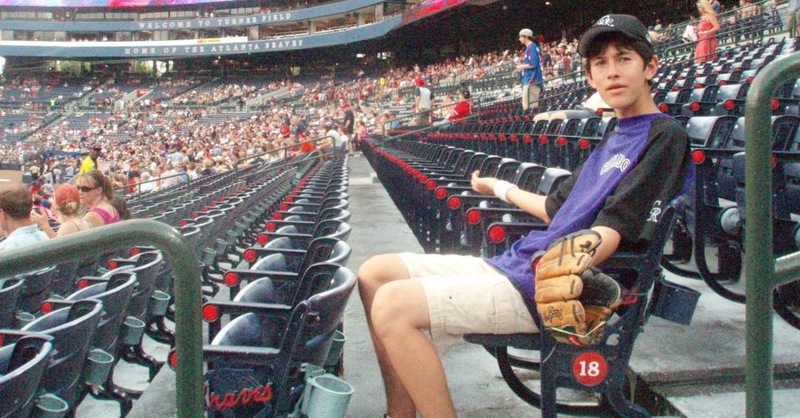 Anyway, the ultimate point I’m trying to get at is that there are a lot of people who travel to Braves fans. Therefore, the crowd is more likely to be passionate. Who do you think will be cheering louder: the fan just getting to the game as a way of relaxing after work or the person who is taking vacation days just to visit their favorite team’s stadium. I hadn’t even considered the geographical factor until I got to Turner Field and talked to people about where they were from. More so than any other stadium I have visited thus far, there were a ton of people from out of town. First of all, I consider “Atmosphere” a contributing factor. Secondly, I couldn’t tell that well about the stadium as a whole, which is why I held off on giving this an A+, but the sample of people I encountered in my three days there were definitely nice in the aggregate. It really did feel like a southern hospitality stereotype was coming to fruition. But more than that, it was so refreshing coming from the New York City environment. For example, in New York you can for the most part tell it is the vendor’s job. In Atlanta, the beer vendors have fun with it. There are vendors that use humor in their selling in New York, but their default emotion while saying the jokes is one of emotionlessness; whereas some Atlanta vendors had the demeanor of a stand-up comedian while in the stands. Well except for the Nick-loving kids. 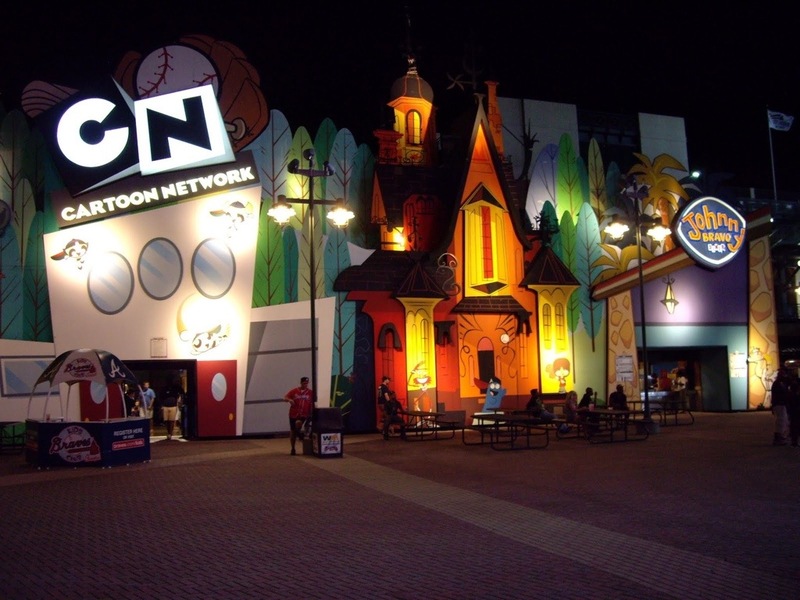 For the record, the reason it is a Cartoon Network themed play area, it is because the team was owned by Turner Broadcasting Systems, which is a part of Time Warner Cable, owner of Cartoon Network. 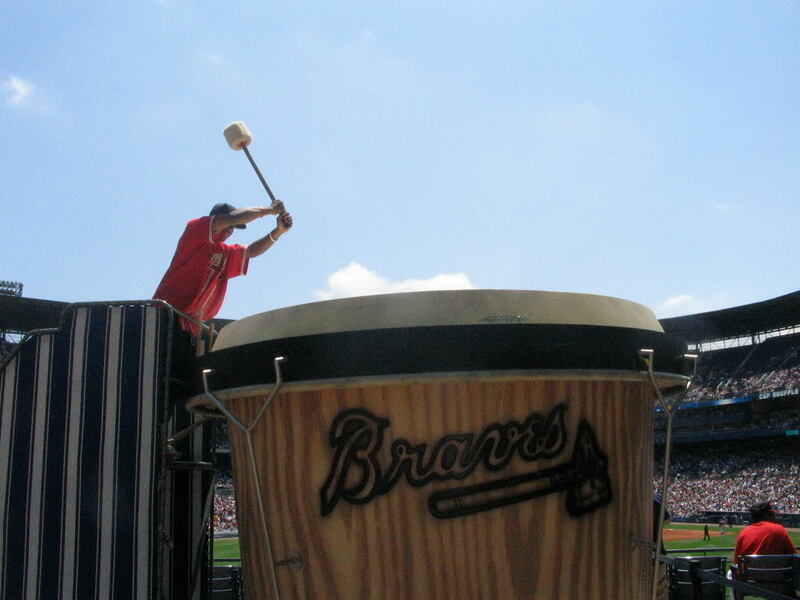 Another great thing about Turner Field’s fan experience is they have a pretty neat museum. It isn’t free on it’s own like most museums, but if you go on a tour of Turner Field (before batting practice), a ticket to the museum is included that you can use all day. If you want to check out these along with other pictures I took on the 4th of July game, here is the link to the gallery on Facebook. This is where you see what a team is made of. 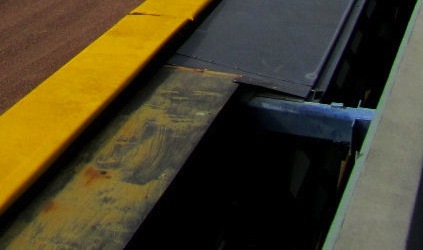 In the details of the stadium.The lazy, unimaginative teams fail here and the better ones thrive. 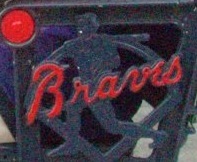 As you can see, the Braves are in the later category. If you didn’t know, my trip last year was at the beginning of July (4th of July 2011 was my first game there). Atlanta in July is not exactly the arctic tundra. Therefore the touch the Braves had with installing fans in the center field concourse/plaza that sprayed water was absolutely magnificent. While center field sections usually aren’t the way to go, this is a pretty viable back-up plan. 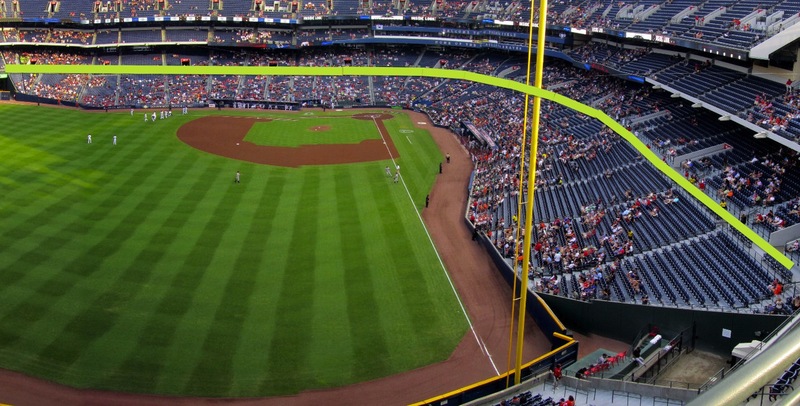 It may seem like light years away from home plate, but even though the home bullpen acts as a partition between it and the right field seats, the rightmost section in the center field seats is really right-center field when you think about it. It’s just the mentality that makes people think it is further than it actually is, but it doesn’t take a shot to reach that section, which can be a nice place to camp out if the left and right field sections of the outfield are crowded. 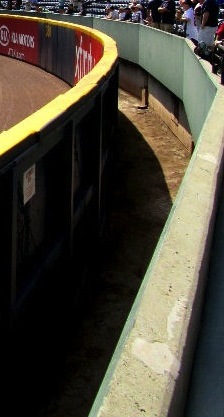 It is a maximum of three feet (probably one or two, so really the only balls that go down there are dropped baseballs by fans in the first row. For the record, I did catch a foul ball, which to this day remains the only foul ball I have ever technically “caught on the fly” off of the bat of Nate McLouth. If you want to check out the gallery from that July 5th game, I’ve linked this entire sentence to the page. Heck, I might as well give you the July 6th gallery while I’m at it. 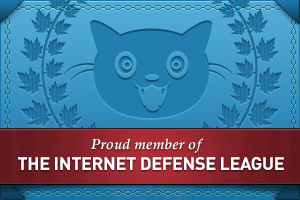 Here’s that link. I was also with my mom for this whole roadtrip, who wanted me to sit with her, but otherwise I might have gone to the cross-aisle once this section filled up a little. Special thanks goes out to Todd Cook for allowing me to use many of his panoramic pictures in the entry from his plethora thereof. If you want to check out his gallery of 10,000,000 pictures and more, check out his museum by clicking on the words you just read. If you have already voted and have a different perspective, I have taken the repeat voter restrictions off and they will remain off for 24 hours after the publication if you want to vote again. However, I do please ask you to only vote one additional time. Disclaimer: As of now, none of the ballhawks have agreed to be interviewed (since I just sent the e-mail five minutes ago), so the person who is interviewed is the highest voted-for person who agrees to be interviewed; not necessarily the most voted-for person period. My vote is for Scoonz. Also Zac Weiss would be a good choice. They have lower profiles and people don’t know as much about them as the others. They’ll have interesting stuff to say. Erik (mlblogscountingbaseballs)- Any suggestions for questions to ask him? I don’t know Scoonz as well as you guys do. I have a couple of questions, but I don’t think I’d get the full entertainment value out of him with them. And I talked to Zac. He can’t do this specific one, but he’s open to doing one in the future. 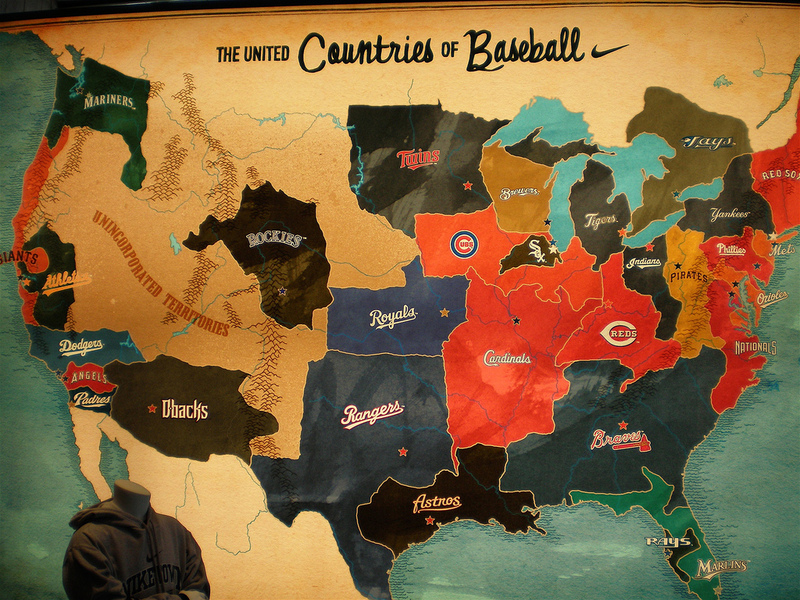 Where did you find the map of baseball territories? It looks awesome! Paul- Google Images. I forget what I typed in, but it should be pretty straight-forward.